We are super excited to announce the first Farm to Table Dinner of the summer! What: A delicious meal featuring locally sourced veggies, meats, cheese and grains from farms throughout Mendocino County. The meal is a surprise, based on what is seasonally available. Dinner is served in family-style courses, complete with appetizers and dessert. Vegetarian options will be available. Who: Everyone is invited! This is a family-friendly event and children are welcome. Why: This dinner is a benefit for the Farmers Market Food Stamp Match fund for the Mendocino & Fort Bragg Farmers Markets. This important program makes local food more affordable for all members of our community by matching Food Stamp/EBT funds. If people spend $10 in food stamps, they will be given an extra $10 in tokens for a total of $20 to spend at the farmers market. This program grows the farmers markets, supports local farms, and gets healthy, fresh food to those in need; it’s a win-win-win! How much: Tickets are $30 in advance and $35 at the door for adults, $15 for children. Available every day at If the Shoe Fits in Fort Bragg & TWIST in Mendocino. Also available at the Fort Bragg Farmers Market every Wednesday from 3 – 6 pm and at Mendocino Farmers Market every Friday from Noon – 2 pm from Julie & me (Sarah), the market managers. We hope you all will join us, and bring your friends and neighbors. It takes the whole village to feed the village! Email eatmendocino@gmail.com with questions, or to RSVP or volunteer. We need people to help with all aspects of the event including food prep/cooking, serving, and clean-up. We are also collecting items for the silent auction, so let us know if you’d like to donate something you do or make! Categories: Events, Farmers, Farmers' Market, Fertilizer, Uncategorized | Tags: Caspar Community Center, dinner, farm to table, food stamp match, mendocino, Noyo Food Forest | Permalink. After launching our Kickstarter campaign only 4 days ago, we are delighted to have raised just over 25% of our goal! As each donation comes in, I’m amazed at the outpouring of support from fans, friends, neighbors, relatives, colleagues, high school classmates, and people I don’t even know! It’s really an incredible feeling to know that each of you has been affected by our journey, and wants to see this book written. 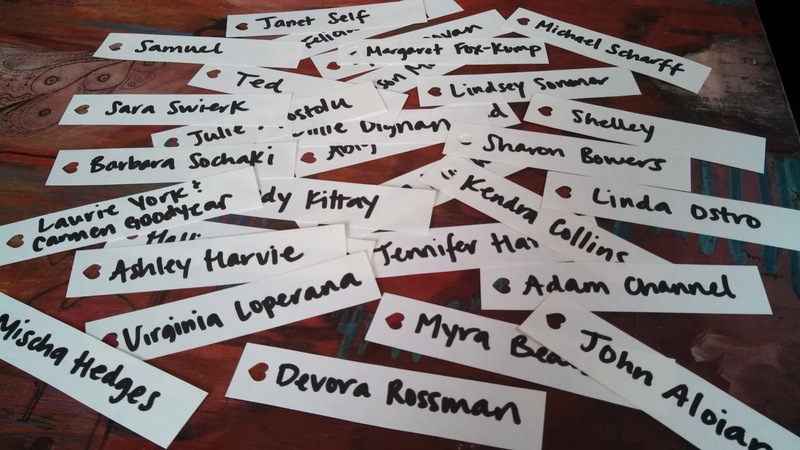 Last night I wrote down the name of each supporter to hang on the gratitude tree, which is a manzanita branch that hangs on the wall of my bedroom. Gowan came by to find me hanging the last name and vocalized her amazement at all the people who love us. She’d been busy tromping around in the mud installing an automatic watering system at the farm and was surprised and moved to see what had transpired amidst our “virtual” community. She pointed at names of past interns, community members, and friends with the same pride and humility that filled me as I decorated the tree. Even though I’d been tracking the donations, the magnitude of it didn’t hit me until all thirty names were dangling from the branch. It was beautiful. And really inspiring. Every single one of you brings us closer to our goal, and makes it evermore real that we are actually going to do this. Upon waking in the morning, the first thing I see is the gratitude tree and I know that 1. this book must be written 2. you all will make sure that it does (even though the idea is a quite daunting). Thank you all for believing in us – and for helping spread the word! 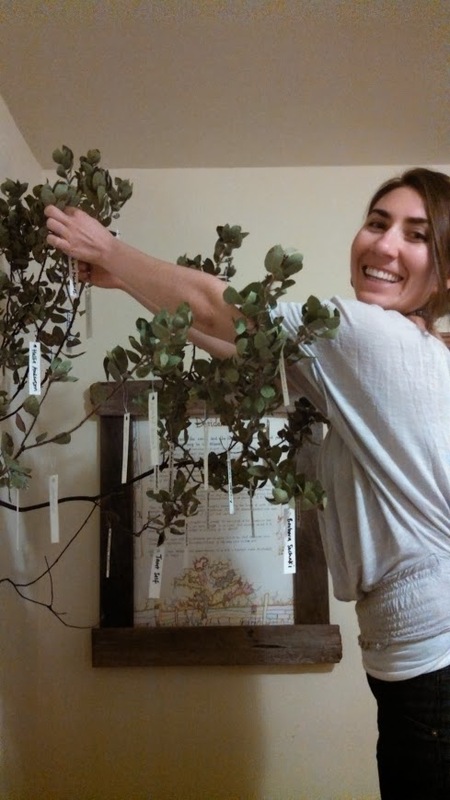 To add your name to the tree, visit our Kickstarter page and contribute today. Categories: Fertilizer, Uncategorized | Tags: eat mendocino, gratitude tree, kickstarter, the book, video | Permalink. A couple of weeks ago we shared some big news. That within our mighty little hearts was a book that needed to be written. And now, we invite you to help us make that happen. We’ve said all the important stuff in this video, and in the project description: what we plan to do, how we plan to do it, and why we feel we owe it to the world to make this happen. Plus, the cool rewards you’ll get for supporting this project. 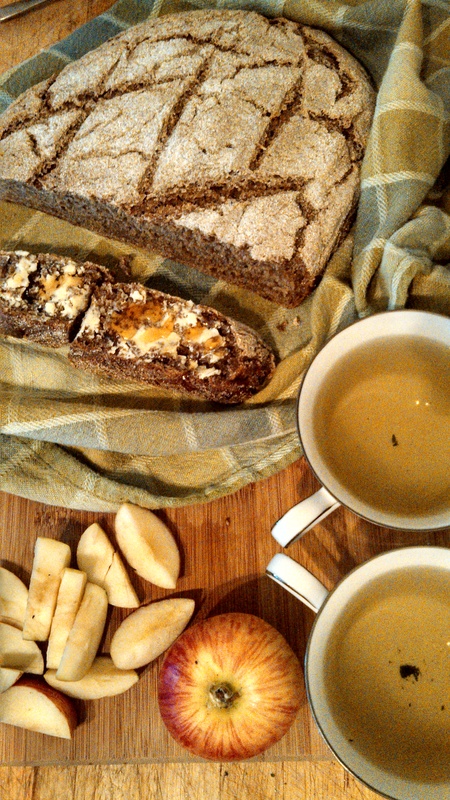 We ate local food for 365 days. Now we have 16 days to raise $5,000. I posted the video on Facebook this evening and we have already raised $340 from 9 backers and it’s not even midnight. My heart is swelling up. This fundraising campaign is short and straight-shooting, ending on Valentine’s Day because it’s my favorite holiday (if you’ve been following us since last February you know I love any excuse to wear hearts), and I really see this book as a love letter to local food, from all of us. The way that Kickstarter works is that you only get the money if you meet your fundraising goal, so know that every dollar counts; it all adds up. Watch the video, spread the word, and be our valentine! Click here to visit our Kickstarter project page and donate. A giant thank you to our wonderful friend Mischa Hedges of TrimTab Media for making this lovely video in record time and doing his best to make me seem charismatic in the morning, with a script that I could not memorize even though I wrote it. Ha! Thanks for all your support in helping us “barnraise” this book! 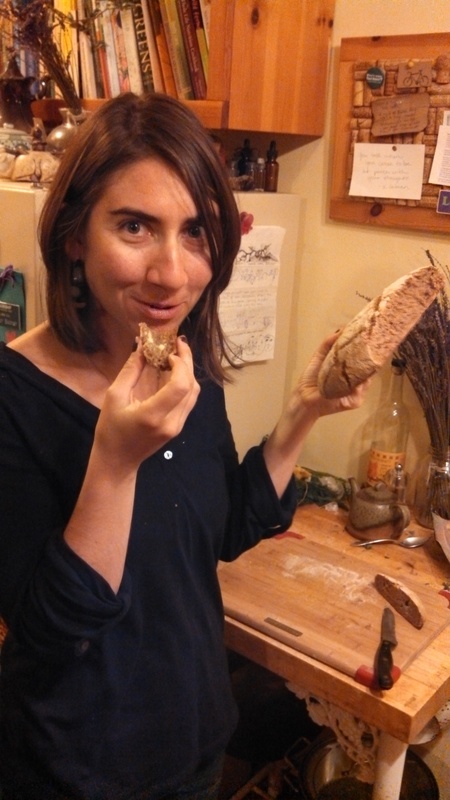 Categories: Fertilizer | Tags: book, eat mendocino, kickstarter, locavores, mendocino county, valentines, writing | Permalink. You’ll have to forgive me for skipping last night’s daily report. I needed a break from the blogosphere after all the excitement, so I watched the Giants game and made dinner with a friend. Of course, we ended up talking about local food all night, while making a delicious dinner (food is pretty much life, so it’s hard to turn it off even for an evening). After publishing the last post, “7 ways to access affordable, healthy food in Mendocino County (and why the SF Chronicle was dead wrong,” our blog traffic was astronomical (for us): 1,240 visitors and 1,737 views on Monday alone. That is equivalent to what we usually attract in a week! It was an adrenaline rush to see such a huge response to the article, and to spark so much important discourse about accessing healthy food in Mendocino County. Thank you to everyone who engaged with the article through sharing it, commenting, and pondering it. It wasn’t possible for us to deal with the constant stream of feedback, as it was Monday and Gowan and I both had to work our day jobs, run errands like normal people, plus breed a goat that suddenly went into heat. The days are very, very full, and this project is like a third job for both of us. In spite of the fact that our article made some majorly positive waves, I have to admit that I felt a little bit defeated by some of the comments yesterday, which basically accused us of being bourgeoisie white girls who don’t know what it’s like to live dollar to dollar. Let me just say that we do, we really do. For me, this last year has been extremely revealing, as I’ve struggled with the constant stresses of trying to find right livelihood in this county and embarked on the largest undertaking of my life – eating local for a year. Additionally, I nearly lost my life in a car accident which I was fortunately able to walk away from, but has left me carless. 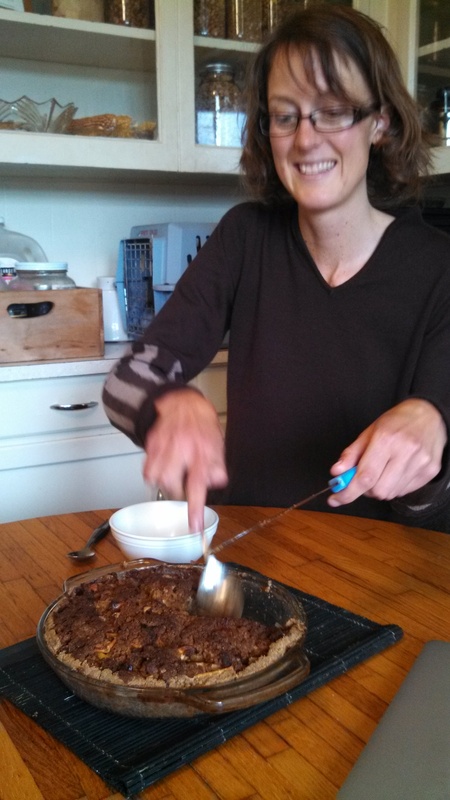 For almost four months, I have been recovering from a serious injury to my pelvis, running my own business, managing the Mendocino Farmers’ Market, plus cooking every single thing I eat from scratch and writing about it on our blog and Facebook page. (I will admit, my sink is often piled with dishes again – the zen kitchen routine I achieved in the first few months of this project has been disrupted. Oh well, life is messy.). And, all of this without a car in a rural area with severely limited transportation. It’s gotten real. Life has been stripped down to the bones, and what matters has never been more clear. I don’t love writing about the vulnerable edges of this experience. I would prefer to talk about how to make kim chee, or show the stunning abundance we have invited into our lives through this journey to get closer to our food. Ok, on that note, I will share a picture of last night’s dessert because beauty is always nearby and it’s important to remember that. But, I understand that this angle of the story is also really important to tell. 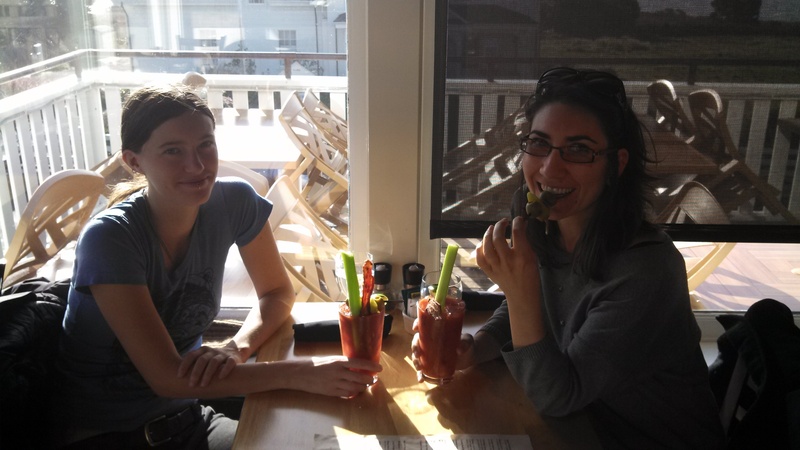 We are not two trend-seeking girls who decided to play Martha Stewart for a year and show everyone how cute it is to eat local. This project was borne out of our deep hunger to transform this community’s relationship with food. Our goal has always been to inspire through doing it, educating people by showing them how, and opening up new pathways for change by showing the gaps in the food system that need to be addressed. We want to be the faces of what’s possible, but we are staring the truth right in the face. We understand the poverty and severe food insecurity that exist in this community. Gowan grows food for the most vulnerable in the population: public school students who are on the free/reduced lunch program in Fort Bragg (which, to underscore, is a whopping 70% of the student population). I ride the bus with many people bound for Safeway or the Food Bank and listen to them talk about every single thing that the SF Chronicle article was trying to say – the main topics of conversation are the cost of everything, the lack of work, and a multitude of health problems. We really get it. So thanks to each of you, for joining us on this journey and listening to what we have to say and believing that it is worth hearing. It means everything; you are why we’re doing it. 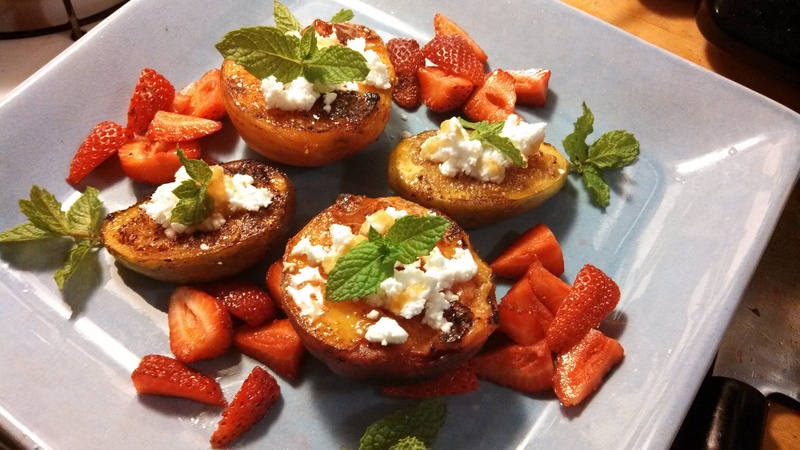 Categories: Fertilizer, Media, Musings, Uncategorized | Tags: daily report, why eat local. mendocino county | Permalink. But, that is not what this blog post is about. This entry is about mobility. It has been a month and a half since I totaled my darling steel tank, Mrs. Butterwheels. I still don’t love talking about it, but it’s essential to understanding how my life is changing in deep and important ways. Time has passed, but I do not like being in cars, to say the least. I try to limit most of my activity within walking radius, and ride the bus or carpool when I really need to. Usually, this works. 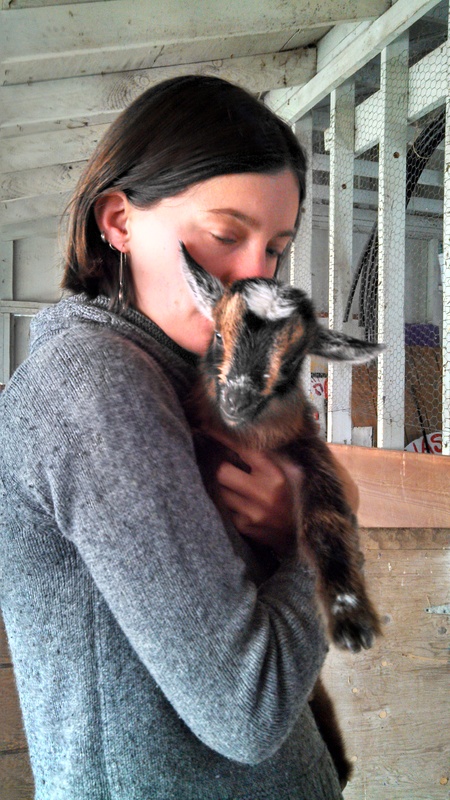 I have swiftly and resourcefully redesigned my life so that I can do most of my work from my living room, walk or ride the bus when I must get to the doctor or visit just-born baby goats. I’m learning to slow down, in profound ways. I am rethinking how much I really “need” to go somewhere, and am exploring the wonderfully dangerous world of online shopping (my shiny new bread knife arrived today!) There are flaws in all of these systems and choices, but it’s basically working out so far and the local diet has yet to be compromised, thanks to many benevolent agents who have delivered food in clutch situations. Ironically, the main obstacle in this locavore’s life is my new gig as manager of the Mendocino Farmers’ Market. It is located approximately 7 blocks from my house, and you would think it’s the ideal job for a localized locavore. Yet, the only thing that has forced me behind the wheel of a car is my market manager duties. I have to lug tons of heavy signs around town before market day, and then bring all the gear for my booth every Friday (table, chair, paperwork, schwag, and the machine to accept Food Stamps, etc.). Thankfully I have many wheeled friends who have been helping me thus far, but I’m feeling far from autonomous and my favors are running out. I have been fretfully wrestling with this conundrum for the past 2 weeks. I need wheels. But, I don’t necessarily need a car. The first thought was a large red wagon, at the suggestion of some of the other market managers. Which might work, but wagons are most efficient when used at the market itself. I need to schlep signs all over town, and then pick them up after a long day at the market. I need to cover ground, and not spend my entire Friday night doing so. The solution became fairly obvious. 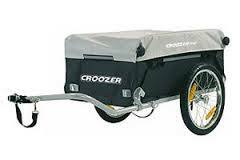 My market budget cannot afford this new expense ($200), so I’m inviting you, beloved fans, to help me get back on the “horse” and fuel a pedal powered local food economy. It’s easy, just click here to donate safely and securely via Paypal. Donations of any amount are deeply appreciated, from the bottom of my shaken but mighty little heart. The market is off to a great start, and I know the season is going to unfold in wonderful and unexpected ways. My goal is to use it as a platform to get as many people excited about local food as possible! Sheriff Allman dropped by during opening day and purchased an apple tree grafted by the horticulture students at Mendocino High School. He invited Gowan and I to visit the County Jail’s garden, which has introduced locally grown food into the jail kitchen, allowed inmates to get their hands in the dirt, and reduced the annual food costs by $40,000! This is what it’s all really about. 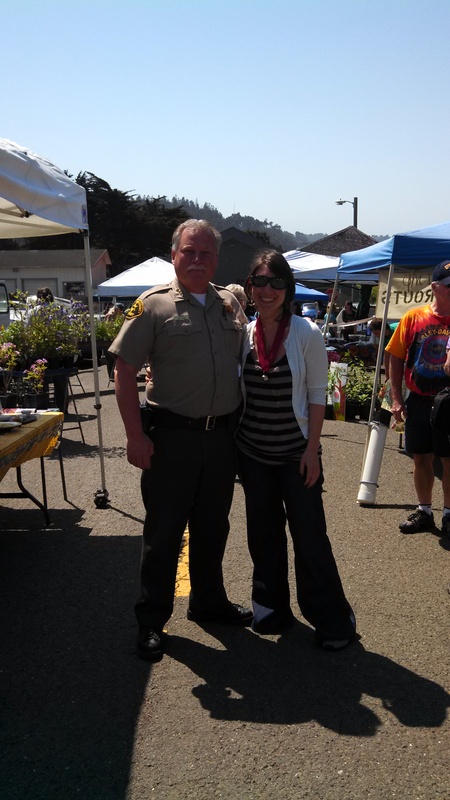 Do come by and say hi to me at the Mendocino market every Friday from Noon – 2 pm. 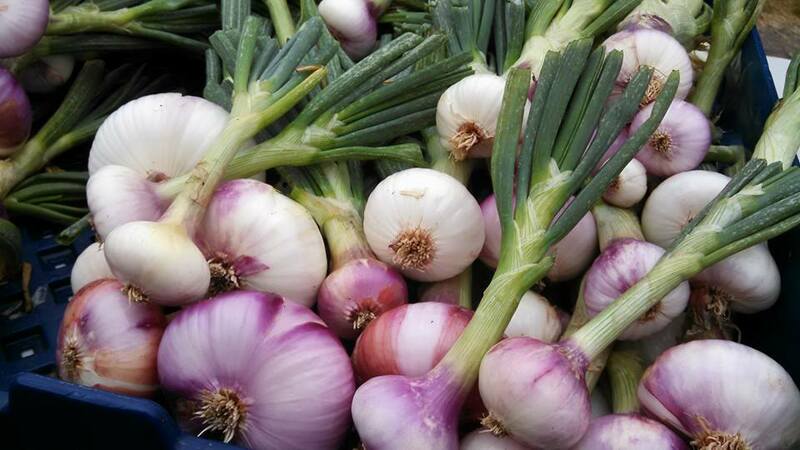 You will find Gowan and her lovely produce at the Wednesday market in Fort Bragg from 3-6 pm. And, if you need to see more baby goat pictures (because who doesn’t? ), check out our Facebook page, and our YouTube channel. Categories: Fertilizer, Musings, Uncategorized | Tags: bike trailer, car, donate, farmers market, local food, locavore, sheriff, tom allman | Permalink.